Earlier this week Stacie shared a great post encouraging us to go beyond survival and instead choose to thrive where we are planted. (If you missed it you can read it here.) Survival is a mode that we too often find ourselves idling in. We do the same thing, day in and day out...forgetting that complacency leads to defeat. It is the difficult things in this life that bring about growth. It is realizing that there is a battle being waged around us between good and evil, a battle in which the enemy seeks to either defeat us, or better yet keep us out of the fight by making us complacent. 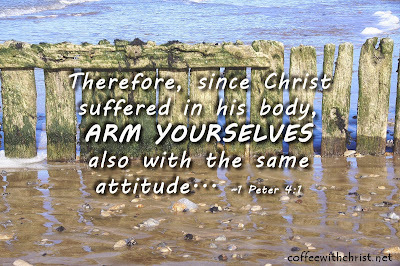 And yet Peter encourages us to join the fray, to arm ourselves for this battle. And yet, how do we arm ourselves? It isn't like we can just visit the local pawn shop and pick up our tools for spiritual battle. I wanted to share a few pointers that I have picked up in my own battles. Hopefully they will help you in yours. 1) Research the enemy. Take the time to read God's word. When we do so we can see what tactics the enemy has used previously, what weak spots he looks for. Understanding the enemy gives us an advantage over him. And the good news is that in the end....we win! 2) Gather ammunition - memorize God's word. Jesus used scripture to battle the enemy in the desert. (Matthew 4:1-11) In His weakest moments He was able to hurl God's truths and protect himself from temptation. We can do the same, but only if we have stockpiled the ammunition before hand. 4) Recognize your weaknesses. None of us are perfect. (Romans 3:10 and Romans 3:23) We each have areas of our life with a target on it for the enemy. If you aren't sure what yours is, pray and ask God to reveal it to you. Do you gossip? Do you doubt God's love for you? Are you prideful? We each have different targets, but the enemy is excellent are discovering them. And yet we tend to try so hard to cover them up, even from ourselves. This makes us very vulnerable to attack. And finally 5) protect and fortify your weaknesses. Once you know your weak spots don't leave them weak. Take steps to strengthen those areas. Read scripture about them, pray for help with them, not only from God but pray that he sends people into your life that can support you as well. There is a reason we are told to gather with fellow believers! By no means is this an exhaustive list. What do you do to "arm yourself" against the enemy?